I look out the front window of my home and across the road I see a herd of beef cattle. I look out off my back porch and I see corn and soybean fields. I look down at my feet and I see my small flock of Rhode Island Red hens wandering about eating grass and bugs. If you ask anyone who drives by my property they’d describe it as ‘country living’. I’m over 8 km from the nearest gas station, and over 25km from the nearest Walmart. I have a well and a septic system, and there is no public transportation. But, alas, my privately owned, half acre piece of paradise is technically ‘Residential Property within the City of Ottawa’. 74 (1) No person shall keep livestock in any area of the City unless the area is zoned for that purpose or is lawfully used for that purpose. When asked what the City’s concerns were regarding backyard chickens in a recent CBC article, Christine Hartig, By-law and Regulatory Services officer for the City of Ottawa says, “Livestock are intended to be in agricultural areas and the issues around the area of having them in urban or suburban areas is that it’s not very conducive to keeping livestock in those types of area where they could potentially cause issues for neighbours”. A couple in Constance Bay, Erika Tar and Andrew Elliott have three laying hens on their property. At 9pm on July 30th, 2013 a By-Law officer showed up at their home. They had received no prior warnings, phone calls, or letters from By-Law. The By-Law officer said a complaint had been filed against them regarding them having chickens in the City of Ottawa. He could not say what the complaint was about specifically, or who it was from, and was not clear to what the consequences would be if they continued to be non-compliant with the by-law. He said he had no choice but to enforce the by-law, and he would be back in three days to see if she had removed the chickens from her property. When Erika realized the By-law officer had the authority to come back on her property at any time and take her chickens away, she decided to take action and has been working diligently to have the by-law amended. She has been granted several extensions on her fine while she challenges it, but it is an uphill battle with the City. In another interview, Hartig says the City’s rules are in place for many reasons: “Attracting predators for example, if they get out; we don’t have an animal shelter prepared to take on chickens. 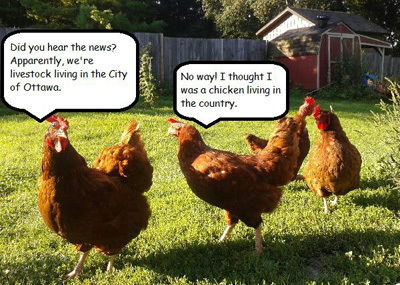 Ottawa’s climate is not conducive to keeping a chicken coop in a backyard somewhere”. This is another classic case of misinformed City officials applying blanket rules and regulations onto urban and rural areas and leaving the enforcement of these rules to the local by-law officer with no respect for individual property rights.